Visit Trig at EAA AirVenture Oshkosh. 2018 will be Trig’s seventh year exhibiting at EAA AirVenture. Trig makes the annual trip to the largest airshow of its kind in Oshkosh, Wisconsin. The show runs from Monday 23th to Sunday 29th July and attracts pilots from all areas of aviation. Warbirds, light sport, experimental, ultralights and GA pilots all gather for a truly unique show. The TX56A and TX57A will be previewed for the first time at EAA AirVenture. Using a slimline form factor, the TX56A will be easy to install and use. At only 1.3” high each unit saves valuable space yet contains an impressive selection of practical features for any pilot. 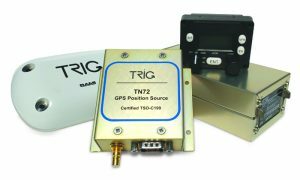 Pilots preparing for 2020 and installing ADS-B Out solutions should think of Trig. The TN72 X is a certified and ADS-B compliant GPS Position Source for experimental and light sport pilots. This separate box weighs only 3.8 ounces and is the obvious upgrade for pilots already flying with a Trig transponder. For certified aircraft, Trig’s TT31 Class 1 transponder remains the popular choice for many, it meets TSO-C166b and provides pilots with class leading Mode-S technology. This year Trig launched the ADS-B Express Lane. With the right avionics Trig Express Lane dealers can now install a 2020 solution in as little as 5-8 hours, three times faster than many competitors. Trig CEO Andy Davis said, “Aircraft owners often overlook the expense of fitting ADS-B, if you have an old KT76A, KT76C or KT78A transponder then a TT31 is a simple slide in replacement. If you also have an existing GTN or GNS WAAS navigator then you qualify as an Express Lane candidate. Trig provides the most compelling and quick upgrade path.” With an AirVenture list price of $ 2,342 the TT31 provides aircraft owners with the best combination of features, quality and value. A free FAA STC allows the TT31 and TT22 transponder to be installed as a compliant ADS-B Out solution for over 600 aircraft types. Both units are compatible with popular GPS position sources including Garmin GNS and GTN WAAS navigators. All Trig products are smart, affordable and future proof and come with a two-year warranty, via a network of Approved Trig Dealers. If you are thinking of equipping or upgrading your aircraft with avionics, then come and meet the Trig team. All Trig products will be available for demonstration and several Approved Trig Dealers will be at the show, offering special EAA AirVenture prices.